As we are finally getting some spring weather here in Calgary I thought I would post some pictures of a of spring coloured quilt. It is made up of pastels with a cute combination of flowers, polka dots, and stripes. Being from a layer cake the fabrics coordinate perfectly and the pink sashing adds the finishing touch. The perfect girl quilt made with a special girl in mind. As you can see, the pattern is very simple but very pretty. All you do is sew together four layer cake squares to make the large blocks, add the sashing, a simple border and voila you're done. The beauty of precuts. 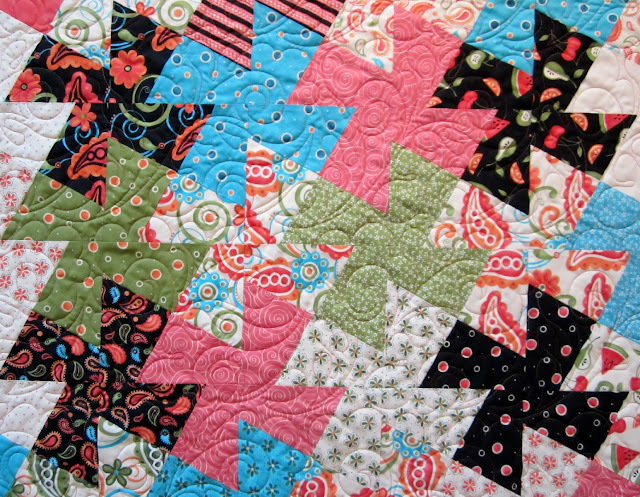 The edge to edge pattern this customer picked is the ever popular Paisley Feather which adds to the quilt's softness. When using a light and simple backing fabric you can make the quilting the focal point just by choosing a little bit darker thread. Paisley Feather is the edge to edge pattern chosen for this quilt. 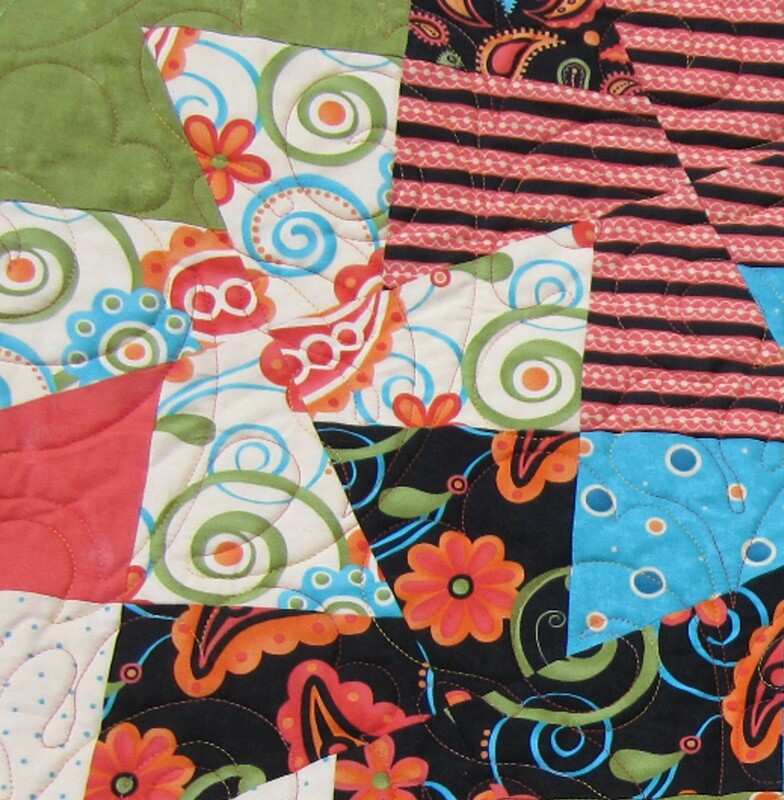 Here's a cute quilt I did for a customer called a Twister Quilt. From the way she described it, it sounds like it was fun to make. It certainly is whimsical looking. The fabrics really complement the style of block and to top it all off the pattern she choose to have it quilted with beautifully mimics the designs in the fabric's themselves. All in all it makes for one cheery quilt. 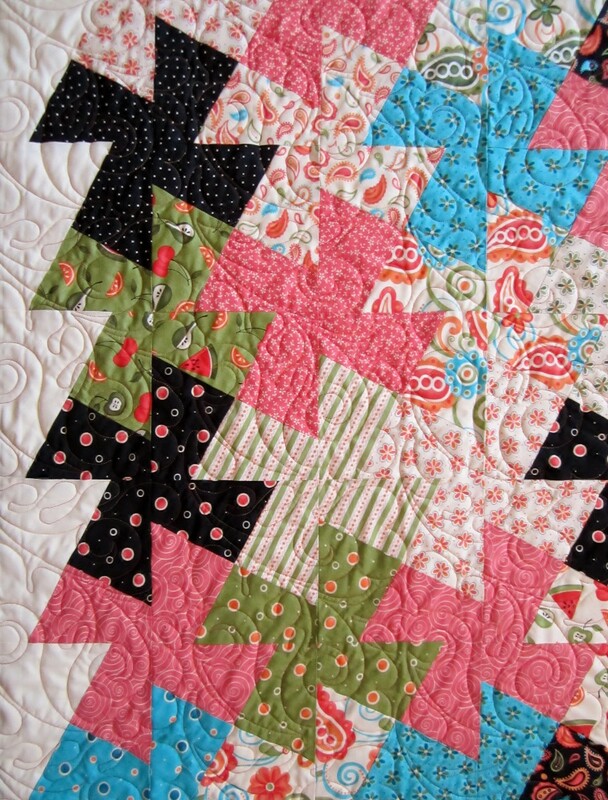 Notice the bumps and curls in both the quilting and the fabric designs. What a great patten for this quilt top. She choose a pattern that had like shapes to the patterns in the fabrics. The pattern quilted on this quilt is called Paisley Feather. It happens to be one of my favourites.